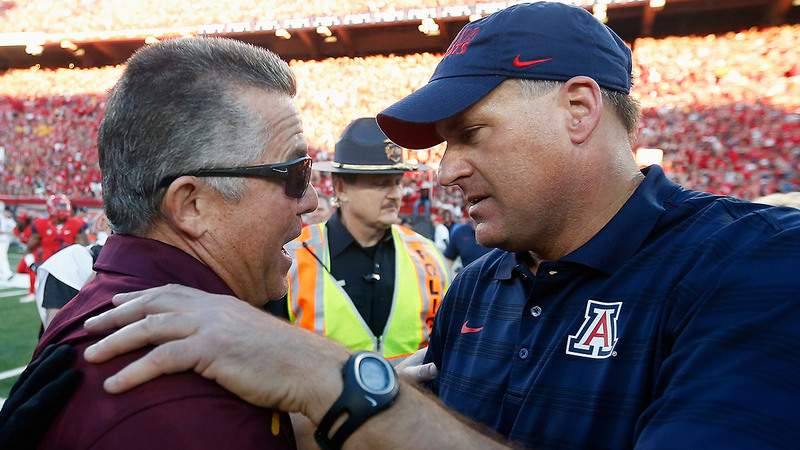 In a way, Todd Graham and Rich Rodriguez are analogues: Each is entering his fourth season at his school, and each has already elevated his football program to new levels of success. They’re both innovative, and aggressive, and fiercely ambitious, and pathologically competitive. And they hope that spells success in the Pac-12 South. College is the time for pairing off, but students aren’t the only ones finding their peers on quads nationwide. Numerous college football programs are on stunningly parallel paths at the moment, so as fall camp progresses, we’ll be taking a closer look at the sport’s sweethearts: the teams, coaches, and players facing similar story arcs in 2015. 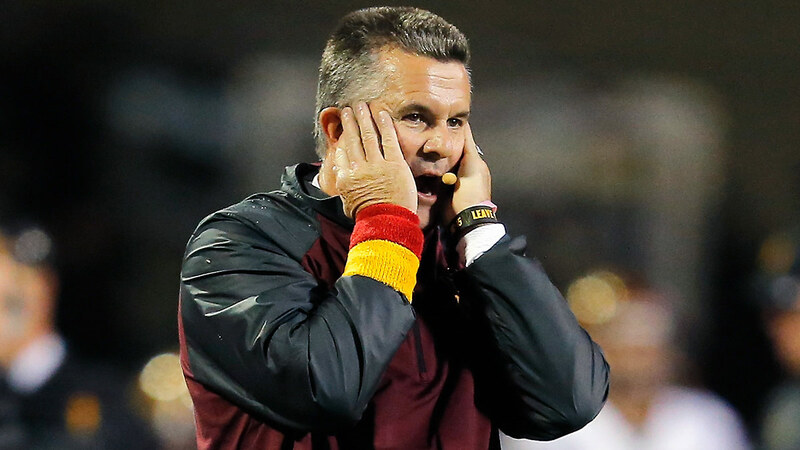 Here are some of the things Arizona State coach Todd Graham tells me during the roughly 30 minutes we spend talking in his office: He is dyslexic. He has a photographic memory. He is a native Texan (which would not have been difficult to discern if I hadn’t known it already, since he speaks with a twang straight out of the George W. Bush school of patois). He fathered a child when he was 17 years old. He struggled to score well on the ACT coming out of high school. He’s made some high-profile mistakes (most notably in taking the head-coaching job at Pittsburgh, which he left after one season for ASU, infamously notifying his players of his decision by text message),1 just as he’s made numerous other, less visible errors in judgment over the course of his 50 years on this planet. And he’s not afraid to discuss these mistakes with his Arizona State players — many of whom have been forced to confront their own errors in judgment — and with his assistant coaches, and even with the journalists2 who have been openly and harshly critical of those mistakes. Graham has defended this by saying his other means of communication had been cut off, and that he had no other choice. It is a Dali-esque August afternoon in Tempe, the air nearing its boiling point, the sun visibly beating overhead, the concrete outside of Graham’s window on the verge of liquefaction. Graham is sitting on a couch and drinking a Diet Dr Pepper, his back to the view of a football stadium that is in the midst of a complete renovation; he is showing me one of the several bracelets he wears on his wrist (“You can tell I’m a dyslexic — I’m a visual guy,” he says), which reads ETG, which stands for “Embrace the Grind,” one of the aggressive slogans that Graham is seeking to turn into a programwide mantra. None of the things Graham shares with me is exactly breaking news: As it is with every major-college football coach, there is a loose script Graham adheres to when speaking to reporters, and it just so happens that Graham’s script currently involves a good deal of psychological candor (whether intentional or not) about both the weight and the occasional cost of his own naked ambitions. In late July, Graham and Arizona coach Rich Rodriguez made a joint public appearance on ESPN, recounting a long personal history that dates back to the NAIA in the early 1990s, when Rodriguez had just devised his read-option offense at Glenville State in West Virginia and Graham was the defensive coordinator at Oklahoma’s East Central (which beat Glenville for the 1993 NAIA national championship). In 2001, Rodriguez would hire Graham to be his linebackers coach at West Virginia. The Territorial Cup is actually the oldest rivalry trophy in the country, dating back to 1899, which explains why it looks a little bit like a receptacle for tobacco expectorant in a Deadwood saloon. While Graham has opened his program wide to the media, Rodriguez does much of his speaking to a national audience through quirky viral videos. There’s an underlying beauty to RichRod’s awkwardness, to the way he Nae Naes his way through his public appearances, embracing the absurdity of his position as a way of tempering an on-field intensity that can veer into intimidating territory. He’s become the Will Forte of college football coaches, given to ridiculous displays and meandering storytelling: At Pac-12 media days this season, he quoted Dumb & Dumber and The Lion King, recounted a story of two elderly ladies flipping him the bird while he was coaching at Michigan, and shared a memory of Washington State coach Mike Leach donning a Speedo and wading into a body of water (an account Leach later rebutted). And so from the outside, it appears that both men are as content as they’ve ever been as head coaches, which doesn’t mean that they’re no longer two of the most ambitious coaches in the country, or that they’re no longer immune to controversy.4 Graham openly admits that last year’s 10-win season was “miserable” because his expectations were so much higher, especially after the Sun Devils jumped to no. 6 in the College Football Playoff standings following a win over Notre Dame in early November; they followed up that breakthrough with a loss to Oregon State. But for now, Graham’s ambition seems directed inward, at the job he has, rather than at the job he might potentially want next. He tells me he likes it here in the desert; he tells me he’s in a place where people come to retire, and while I’m still not entirely convinced this is Graham’s last job, I also believe there is enough of an inherent challenge at ASU that, at least for now, he no longer seems to be thinking ahead to his next so-called step up. Graham’s longtime offensive assistant, Mike Norvell, says it’s a “no-brainer” that Graham’s comfort level has changed since he got to Arizona State. “This is a place that fits him,” Norvell says. Until this week, that son Graham had at 17, Bo Graham, was his running backs coach; Bo Graham resigned this week, reportedly after having a relationship with an ex-athlete at ASU. Graham and his wife bought a house near campus that used to belong to Poison’s Bret Michaels;5 they’ve made considerable donations to the university (including $500,000 toward the Sun Devil Stadium renovations), which Graham says is proof of his commitment to a job that he has no intention of abandoning anytime soon. Or at least, I imagine, not until he makes a serious run at a national championship. Actually, they bought another house first, then bought Michaels’s house and sold the first one. It’s hard to know how happy Rodriguez will be at Arizona in the long term — if he’s found contentment in middle age, at 52, or if his aspirations will eventually lead him somewhere else. But at least for now, he, too, appears to have found his sweet spot. He has a budding star this year in sophomore quarterback Anu Solomon, and he has perhaps the best linebacker in the country (or at least the linebacker most equipped to solve mysteries) in Scooby Wright III. I imagine it’s a relief for a personality as singular as Rodriguez to be in a place where the scrutiny is at least somewhat more diffuse than it was at Michigan (or even at home in West Virginia, where a younger and even more ambitious Rodriguez made few friends after bolting for Ann Arbor). Arizona is a simpler job, burdened with fewer expectations than either of those previous positions; before last season, when they beat Arizona State and won the Pac-12 South, the Wildcats had won 10 games only twice in school history. 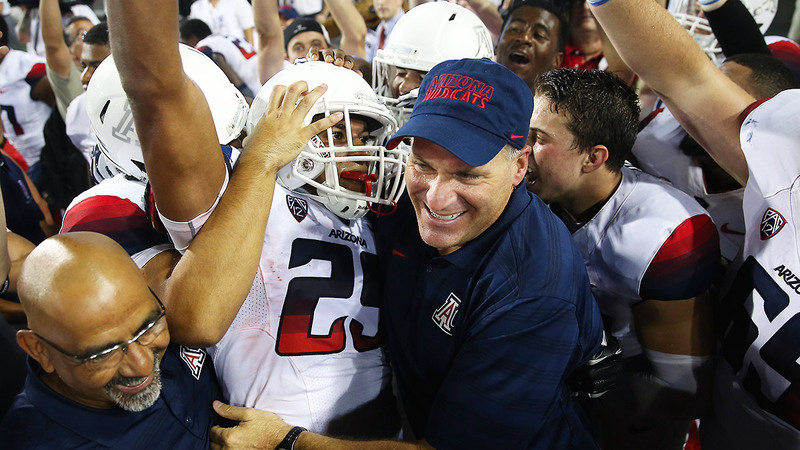 No longer does RichRod have to pretend to be someone he’s not. He can embrace the quirks that got him here in the first place (and, given his invention of the zone-read offense, that helped revolutionize football as we know it). He’s working from an underdog’s position, even in his own state: While Graham can sell recruits on the burgeoning Phoenix area (and on one of the largest and most party-friendly student bodies in the country), Rodriguez has to inform them where Tucson is actually located. That’s the way Rodriguez diplomatically characterized his philosophy as opposed to Graham’s: It’s just different. Rodriguez says he channels his ambitions into the process; Graham is unafraid to unabashedly project his expectations onto posters, onto the walls of meeting rooms, onto his own wrists. “I’m using every angle I can to win games,” Graham says. He preaches aggressiveness on both sides of the ball: In 2014, the Sun Devils put up nearly 37 points per game, and if their defense improves at all — and if they survive an opening-weekend test against Texas A&M in Houston — those national championship aspirations may not prove to be misplaced. They have one of the best all-purpose backs in the country in D.J. Foster, who has moved to receiver this season but will likely wind up playing all over the field. 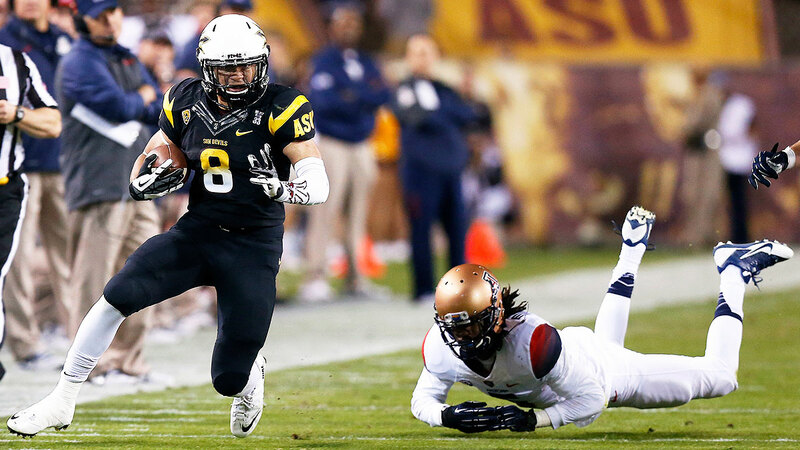 They have a fifth-year senior at quarterback (albeit a relatively inexperienced fifth-year senior) in Mike Bercovici. And they have something else that once seemed near-impossible: a trust in their coach that wasn’t there at the beginning given his history. But for now, at least, this is a golden age for college football in the state of Arizona: a pair of teams trending upward, a pair of teams whose coaches appear to have found at least a small measure of contentment in careers defined by both high-profile successes and high-profile mistakes. They both came to Arizona from places that didn’t fit them; they both came to Arizona with the intention of refocusing programs that had been given, in recent years, to a certain contentment with mediocrity. Go back and watch that joint ESPN clip again: You see two coaches with their hands crossed awkwardly in their laps, two coaches who would prefer to be talking about anything but each other, two coaches who are doing their best to be “collegiate” but are also pathologically competitive, two coaches who are seeking to mitigate the errors of their past in part by measuring themselves against the other. Back in his office, Graham tells me, “Any year we lose to Arizona is a miserable year,” and outside his window the sun glints over the bleachers, the afternoon growing hotter by the minute.